Defined by its ethereal white mini-mountains, picturesque fishing villages, ancient creeks and tiny coves, Cornwall’s south coast bears little resemblance to the famous headlands, rolling dunes and huge crashing waves of the surf-obsessed north. What was once a land of pirates and smugglers is now a tourist hotspot complete with a climate to almost rival the Med, long stretches of sandy beaches and plenty of attractions that connect the area with its maritime history. This diverse landscape on the far western tip of England is also known as Daphne Du Maurier country – the writer wrote 17 novels and numerous short stories inspired by the wild beauty of the Cornish coastline. The South Cornwall Coast boasts a heady dose of beach action; from secluded rocky coves to huge expanses of soft golden sand overlooking the sparkling Atlantic Ocean. The fun starts in Falmouth, historically one of Britain’s most vital ports and home to the National Maritime Museum – an award-winning attraction where culture buffs can get a taste of the town’s nautical heritage. Most popular for families is Gyllyngvase Beach, a Blue Flag status beach complete with a wide arc of golden sand that is patrolled by RNLI Lifeguards from mid-May until the end of September. Falmouth’s other beachy treasures include Castle Beach, a small beach with rock pools alongside Pendennis point, Swanpool Beach, a sheltered sandy beach with an outstanding watersports center for wet and wild antics, and Maenporth Beach, a sheltered east-facing sandy beach set between small headlands that is ideal for rockpooling, fishing and boating. For calmer seas and secluded beaches, head to the statuesque cliffs, hidden coves and sublime bays of the Roseland Peninsula. Even in the summertime, the pretty sandy coves that lace Cornwall’s most tranquil corner remain blissfully empty. Cross one of Cornwall’s deepest rivers, The River Fal, on the King Harry Ferry. Connecting St Mawes (a small town opposite Falmouth) and the Roseland Peninsula with the towns Feock, Truro and Falmouth, this service has been an iconic part of Cornwall’s history since 1888. The journey, which is free for pedestrians, takes just ten minutes and avoids the otherwise 27-mile route through Truro and Tresillian. One of the jewels of the Roseland Peninsula is Mevagissey, a traditional Cornish fishing town which still boasts a working harbor. Explore the labyrinth of tiny streets, wander narrow alleyways and watch fishermen land their catch before hitting the Mevagissey beaches. Portmellon Beach is a sandy spot set in a small cove where seals can sometimes be spotted resting on the rocks whilst Pentewan Beach is a large sandy expanse that is ideal for watersports; jet skis are banned here but canoes and sailing dinghies can be hired nearby. A more secluded spot is Vault Beach, a mainly shingle beach situated to the east of the Dodman Point that does have some sand at low tide. For family fun, Porthluney Cove at Caerhays (often referred to as Caerhays Beach) is overlooked by the imposing 200-year-old Caerhays Castle. As part of the castle estate, the privately-owned beach offers plenty of golden sand and waters that are free from powerboats and jet skis. 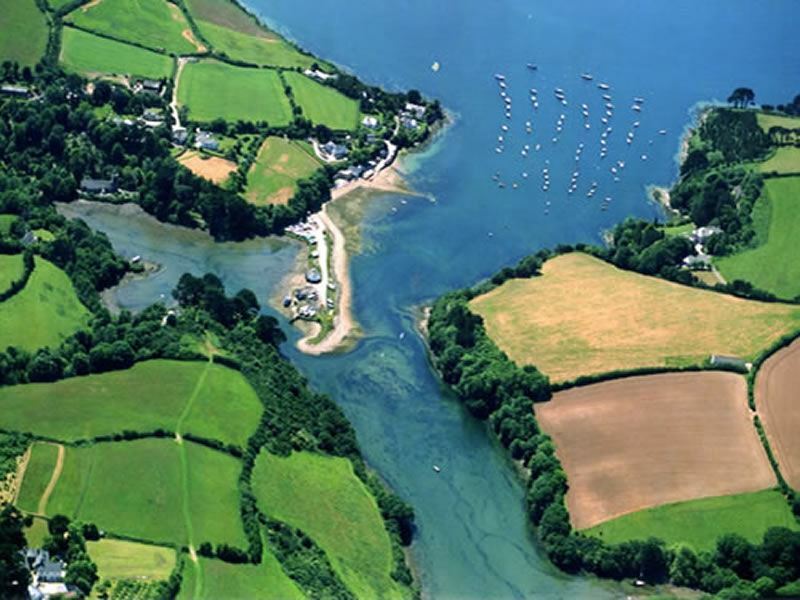 This unspoilt gem is located in St. Austell, a bustling market town which is often referred to as the ‘Cornish Riviera’. Most famous for its huge reserves of china clay that were discovered in the mid-18th century, the town is the perfect base for the Eden Project, Heligan Gardens, the China Clay Museum and much more. Sandy pleasures here include Par Sands Beach, a sandy stretch backed by dunes, Charlestown Beach, a sloping shingle beach accessed by steps from the historic harbor, and Porthpean Beach, a superb spot for swimming and beach games. Around eight miles east of St. Austell is the Cornish fishing village of Polperro, a picture-postcard treasure where the beach is set just outside the harbor walls and is a mix of coarse sand and shingle. Finally, for a Daphne du Maurier fix, visit Fowey, located between Looe and Mevagissey. Designated as an Area of Outstanding Natural Beauty, this enchanting town hosts an annual festival in May to celebrate the author’s life and work. Aside from its narrow steep winding streets, quaint cottages and cobbled walkways, the town’s harbor attracts a multitude of yachts, sailing dinghies, motor launches and leisure boats. The coastline here is distinctive and varied; filled with hidden coves and sweeping golden beaches. Highlights include Ready Money Cove, a sheltered sandy beach close to the mouth of the River Fowey, and Polkerris Beach, a cove-like family-friendly beach located a few miles from the town. Cornwall’s South Coast is the home to five of the county’s biggest tourist attractions; the Eden Project, The Lost Gardens of Heligan, Trebah Gardens, Flambards and the National Maritime Museum. Opened in March 2001, the world-famous Eden Project is a living theater of plants, often referred to as the world’s largest greenhouse. Designed to promote the vital relationship between plants, people and resources, this enormous ecological project is located in Bodelva near St. Austell, in the heart of Cornwall’s Clay Mining country. Thousands of incredible plant species from distinct biospheres are housed in two vast Biomes and one ‘roofless’ Biome, all of which look like out-of-this-planet giant bubbles. The Tropical Biome is a jungle environment filled with tropical plants, the Mediterranean Biome houses arid and warm temperature plant species from the Med, South Africa and California and the Outdoor Biome is filled with plants such as tea, lavender, hemp and sunflowers. Set aside four to five hours for your visit and don’t miss the chance to ride the SkyWire – England’s longest zip wire that spans the width of the Eden Project’s 35-acre pit and offers awesome bird’s eye views of the surrounding countryside. The entrance charge is £23.50 for adults; £10.50 for children aged 5-16. For more horticultural fun, The Lost Gardens of Heligan near Mevagissey are deserving of the hype. The estate of the Tremayne family for over 400 years, the flamboyant gardens were neglected after the First World War and restored in the Nineties. Unveiled to the public in 1992, these fairytale gardens still retain their charm and offer over 200 acres for exploration. Visitors can stroll around the romantic Victorian Productive Gardens and Pleasure Grounds, both of which are set along winding paths that were laid out over two centuries ago. Most impressive is the Jungle where you can lose yourself in tunnels of towering bamboo, take an adventure along a raised boardwalk past banana plantations and avenues of palms and feast your eyes on a flourishing plant collection. The entrance charge is £10 for adults; £6 for children aged 5-16. Further floral magic is to be found at Trebah Gardens, a 26-acre sub-tropical paradise with a stunning coastal backdrop in Mawnan Smith near Falmouth. Discover four miles of footpath at this Cornish valley garden; explore canopies bursting with exotic blooms and follow vibrant tunnels of floral color that cascade down to a secluded beach on the Helford River. Trebah comes alive in spring with a colorful array of 100-year-old rhododendrons, magnolias and camellias; in summer, the giant gunnera steals the show. The gardens also feature adventure play areas and dedicated children’s trails. The entrance charge is £8.50 for adults; £2.50 for children aged 5-15. For pulse-pounding white-knuckle thrills, Flambards in Helston is a fun-filled fantasyland boasting plenty of attractions. Adrenaline-packed rides include the Hornet Rollercoaster which hits speeds of 42 kilometres-per-hour and the stomach-churning Thunderbolt which reaches dizzying heights. Inquisitive minds will enjoy the Hands On Science Experience and a series of fascinating exhibitions including the Britain in the Blitz, War Gallery, Aviation Experience and Victorian Village, a full-size reconstruction of a typical Victorian Village with 50 shops and homes to explore. The entrance charge is £17.50 for adults; £12.50 for children 95cm to 15 years. Celebrating the sea, boats and Cornwall, the National Maritime Museum in Falmouth houses 15 galleries spread over five floors – each dedicated to the town’s illustrious seafaring past. Highlights include the huge Flotilla Gallery, where boats are suspended from the ceiling, and the spectacular Set Sail exhibit, an audio-visual experience about nine ground-breaking boats. Most exciting for kids is the Lookout, with a 360-degree panorama of Falmouth Bay and excellent views over the harbor and estuary. The entrance charge is £11.00 for adults; £7.50 for children aged 6-15. Spectacularly set on the waterfront at Fowey, The Old Quay House is a former seamen’s refuge that has been fabulously restored as a luxury boutique hotel. Housed in a whitewashed Victorian building, there are 11 elegant and tastefully-appointed guestrooms; each is individually styled with soothing contemporary décor in whites, creams and neutral tones and quirky design pieces. All rooms have en-suite bathrooms – a couple feature roll-top baths. Be sure to book a room with a balcony overlooking the estuary with sweeping views of the neighboring village of Polruan. Dinner, bed and breakfast costs from £255 per night in a Classic Double; from £400 per night in the Penthouse Suite. A cheaper bet is Highcliffe – an award-winning B&B located 150 metres from the sea and within easy walking distance of Falmouth’s beaches. Each of the eight individually-designed bedrooms in this Edwardian house exudes chic and contemporary touches; from flat screen/DVD digital TVs and iPod docking stations to pocket-sprung mattresses and en suites with power showers. The made-to-order Cornish breakfasts here are definitely worth getting out of bed for. Doubles from £75, including breakfast. For those seeking flexible self-catering accommodation, Cornwall Cottages features an extensive and eclectic collection of almost 300 vacation homes, cottages and apartments in the county that sleep between two and 17 guests.